In the journals second issue, we have continued to present a diverse range of topics covering development finance and economics. Topics such as Financial Development and Manufacturing output nexus in Nigeria: The role of institutional quality, to Foreign aid and sustainable inclusive growth in Africa. All the articles provide some insights and policy implications for policy makers and stakeholders in general to consider. The first article on Financial Development and Manufacturing output nexus in Nigeria: The role of institutional quality examined the mediating role of institutional quality in the relationship between financial development and manufacturing output in Nigeria during the period from 1984 to 2016. To achieve this objective, the researchers utilized autoregressive distributed lag method (ARDL) to determine the short-run and long-run effects of financial development and that of its interaction with institutional quality indicators (democratic accountability, bureaucratic quality and control of corruption) on manufacturing output. In short, the findings revealed that financial development contributes positively to manufacturing output in the long-run. However, this contribution was moderated downwards by institutional quality indicators. The second article featured in the journal is empirical in nature titled “Foreign aid and sustainable inclusive growth in Africa”. The researchers empirical work was motivated by recent pronouncement that extreme poverty has been reducing in all regions globally for the exception of Africa and Nigeria being the new poverty capital of the world. To be sure, the study was based on 53 African countries with data for the period 2005-2012 and Generalised Method of Moments. The adopted foreign aid variables include: aid for social infrastructure, aid for economic infrastructure, aid to the productive sector, aid to the multi sector, programme assistance, action on debt and humanitarian assistance. The results revealed that whereas foreign aid improves inclusive human development in the short-run, it decreases it in the long term. Policy implications are discussed in the article. In the third article the researchers examined greenhouse gas emissions reduction in Africa adopting a time series panel data analysis from the period 1995 to 2014. A unit root test was carried out on all the variables in order to ascertain its stationarity and it revealed the variables were integrated in order l(1) and l(0). After the cointegration test, it was discovered that the variables were cointegrated, so it became necessary to conduct a VECM analysis and affirmed that agriculture (AGRIC) was positive to food security (FPI. In the final analysis, the researchers recommended increased efforts in creating more incentives which will contribute positively towards the reduction of gas emission in agriculture should be very important to all in Africa. In the fourth and final article for this issue the researcher examined the effect of public debt on financial development between 1981 and 2016 using Dynamic Ordinary Least Square (DOLS). The focused variables are financial development and public debt. The ratio of private credits to GDP, the ratio of broad money, M2 to GDP and the ratio of commercial bank asset to the sum of commercial bank asset and Central Bank asset are used to measure financial development which is the dependent variable. The control variables include GDP deflator, lending rate, gross fixed capital formation, and government expenditure. The results of the study revealed that public debt has a positive effect on financial development in Nigeria. This, therefore, supports the safe asset view. Thus, public borrowing which serves as a safe asset for financial intermediaries will encourage lending to the private sectors which will ultimately increase financial development and economic growth. 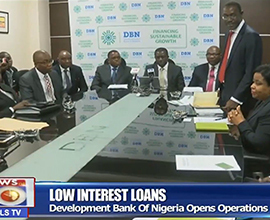 Furthermore, the researcher opined if government borrowing and private credit are channeled to the productive sector of the economy, the economy will grow which will ultimately promote economic development in Nigeria. On a final note, permit me to take the opportunity to thank the Board of Directors of the Development Bank of Nigeria (DBN), the Management team led by Mr. Tony Okpanachi MD/CEO, all the staff of DBN and last but certainly not the least, our contributors to the second issue. Because without each of your contributions, this novel idea would not come to fruition. It is my hope that the imagination of all readers of the DBN Journal of Economics and Sustainable Growth and the DBN Working Papers Series is broadened and a shift in policy direction begins to take shape.